Today’s stitch is a wonderful and bright explosion of red, one of the most traditional holiday colors. Red also happens to be overly represented in my shoe and purse collection. So, I’m not exactly impartial when it comes to this color. Today's stitch comes from a Raymond Crawford holiday pillow. The blocks of color drew me to the pillows as they lent themselves to fun stitches. 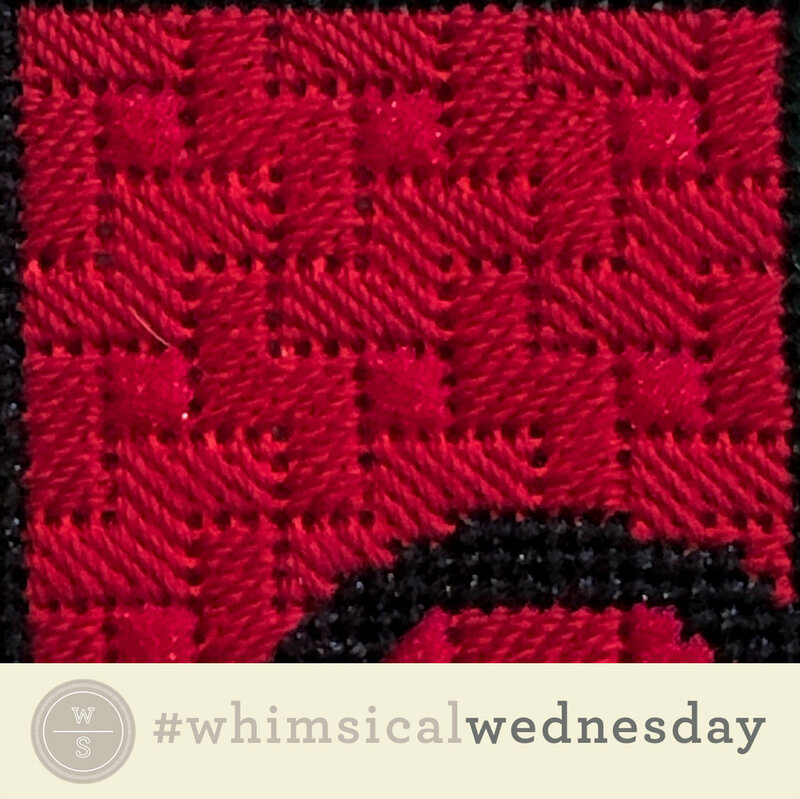 The red block in the stitched sample uses Elegance and Flair (on 18-mesh). I used two colors to illustrate the alternating Byzantine patterns to help you navigate the stitch. I’m not going to lie; it was a challenge to catch a groove on this stitch. That said, I love the end result and the swearing and pulling out was completely worth it. I would love to see this stitch on a floor or roof with Elegance (for the black and gray lines) and an overdyed something for the yellow 3X3 squares. It really doesn’t matter if it’s wool, silk floss, or metallic overdyed. I love the combo of matte and overdyed. It works well in almost any area you want to draw attention to, especially clothing or a holiday bag. Play with it. It could be almost subtle with a silk floss and Entice. You could really draw attention to it with Petite Very Velvet for the black and gray lines partnered with an overdyed ThreadWorx metallic for the yellow lines. Consider beading the 3X3 squares to really go over the top.